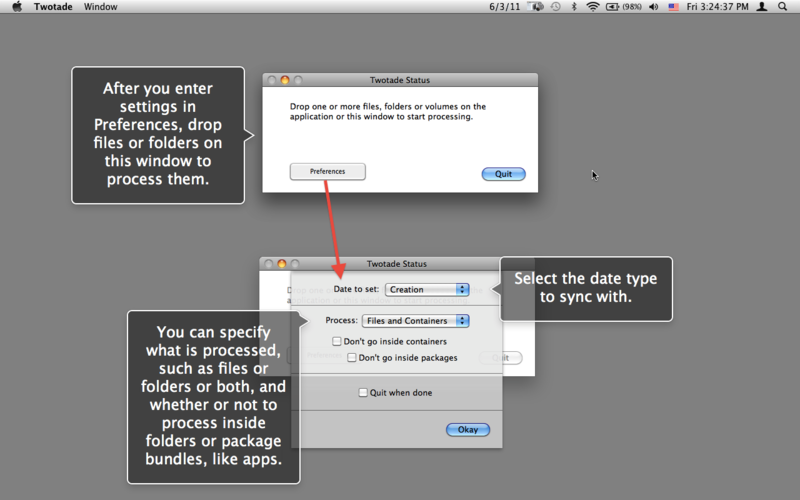 Twotade | Set the creation dates of files and folders to the modification date, and conversely. Set the creation dates of files and folders to the modification date, and conversely. Twotade is a drag and drop app utility for setting the creation dates of files and folders to the modification date, and conversely. Various options are available, such as only processing files, or only processing folders, or both. How to use: Simply drag one or more folders on top of the Twotade application icon in the Finder, on the application window. Processing begins immediately.